Why don’t they just go to Tims? 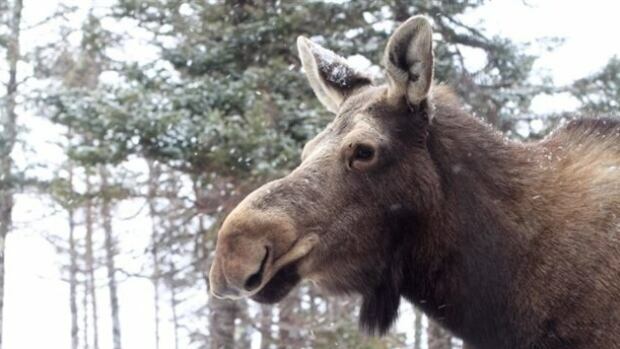 Alberta government officials are warning visitors to Peter Lougheed Provincial Park about moose licking the salt off vehicles parked at the Chester Lake and Burstall Pass trailheads. Watch out for moose who like to lick vehicles. That’s a warning from the Alberta government for people visiting Peter Lougheed Provincial Park about 130 kilometres west of Calgary. Alberta Parks says moose are on the trails at Chester Lake and Burstall Pass and are coming into the trailhead parking lots to lick salt off the sides of vehicles. The government advises people to sound their horn to try to get the salt-lickers away from their vehicles. It also warns to not try to push a moose away from the vehicle. In Canada, a female moose weighs an average of 750 to 926 pounds and a male moose averages between 992 and 1,102 pounds. Alberta Parks issued the warning Tuesday and ask people report any aggressive moose encounters to them. Ocean Falls, B.C. averages 330 days of rain per year. The low availability of sunlight has prompted a South African family with pophyria to move to the area. Unable to get visas to move there, they had to take their case to the Supreme Court of Canada to receive the right to stay. The best-known use of this element is in Caesium-based atomic clocks – which are so accurate they would only be off by 2 seconds over a 65 million year lifespan. It’s also used as a lubricant for large drilling projects. The world’s richest deposit of caesium (roughly two-thirds of it) is at Bernic Lake, Manitoba. CALGARY (The News Desk) — Popular musician Corb Lund was euthanized at the Calgary Stampede on Sunday after the singer fell and broke his leg during a performance. Lund was a 52-year-old Edmonton native who had a previous career as a show horse before a friend convinced him to get into music. Lund’s band has been given a $2,500 fine and will be forced to start five seconds later in next year’s Stampede. Steps have been taken in the past to limit the number of musicians that have to be put down each year, such as mandatory physicals and closing the open bar backstage, but at least one musician has had to be euthanized every year regardless. Musician rights activists were furious, and rallied outside the Saddledome for hours Monday morning. “This is a disgusting violation of his rights,” said Samantha Perton, a campaigner at MusicWatch. “He should have been put out to pasture, where he could live the rest of his days among other musicians. Canada is so large a country that it does not have enough names to contain all of its wonderfulness. That’s why it has two Maritime cities with almost the same names, St. John’s Newfoundand and St. John New Brunswick. It also used to have two professional football teams named the Saskatchewan Roughriders and the Ottawa Rough Riders, who have since gone defunct. A new team in Ottawa is called the Redblacks. Dating website MissTravel.com asked 40,000 single American male users to select the nationality they found most attractive as well as the characteristics about that nationality that made it attractive. Resoundingly the deciding factors were body type and accent. Canadian ladies ranked at number nine, three places below number six: Bulgaria. Those more interested in the Y chromosome, Canadian men also ranked in at number nine. I’d tell you who the other nine were but as a raging heterosexual I don’t give a flying @$@( and couldn’t be bothered looking. The Beaver Will Save the World!!! A growing number of scientists, conservationists and grass-roots environmentalists see the beaver as a much overlooked tool when it comes to reversing the disastrous effects of global warming and world-wide water shortages. The Beaver Whisperers will revisit the industrious rodent and see it through the eyes of people like the University of Alberta’s, Dr. Glynnis Hood, whose astonishing scientific research findings are presented in her new book, “The Beaver Manifesto, ” and former trapper, Michel Leclair, who today “employs” an army of beavers to help him control flooding in Quebec’s Gatineau Park. The documentary accompanies these and other “beaver whisperers” as they reveal the ways in which the presence of beaver transform and revive landscapes. The Beaver Whisperers reveals what it is that makes our national icon such a brilliant hydro-engineer and explores how beavers are being recruited to accomplish everything from finding water in a bone-dry desert to recharging water tables and coaxing life back into damaged lands.